President Trump called the trade agreement between the U.S, Canada and Mexico "the worst trade deal maybe ever signed anywhere." Next month, his team will begin renegotiating the North American Free Trade Agreement (NAFTA) with Canada and Mexico. The first round of talks on the three-nation pact will take place August 16-20 in Washington D.C, according to a statement published Wednesday by Trump's U.S. Trade Representative. A new NAFTA was one of Trump's core campaign promises to working class voters who feel left behind by globalization. Trump blames NAFTA for an exodus of U.S. manufacturing jobs. Nonpartisan congressional research in 2015 concluded that NAFTA did not cause mass job loss. Still, Trump credits his opposition to NAFTA as a central reason for his election victory. He briefly threatened to pull out of the trade agreement in April before deciding to renegotiate instead. Trump wants a new deal to lower the U.S. trade deficit with Mexico, which was about $63 billion last year. His other objectives include tighter labor laws, higher environmental protections and stricter rules on where manufacturing products are sourced. The stakes are high: About 14 million U.S. jobs depend on trade with Canada and Mexico. Over $1 billion of commerce crosses the northern and southern borders of the U.S. daily. Trump maintains that if a better agreement cannot be reached during the rounds of talks expected to go through January, he will withdraw the U.S. from NAFTA. 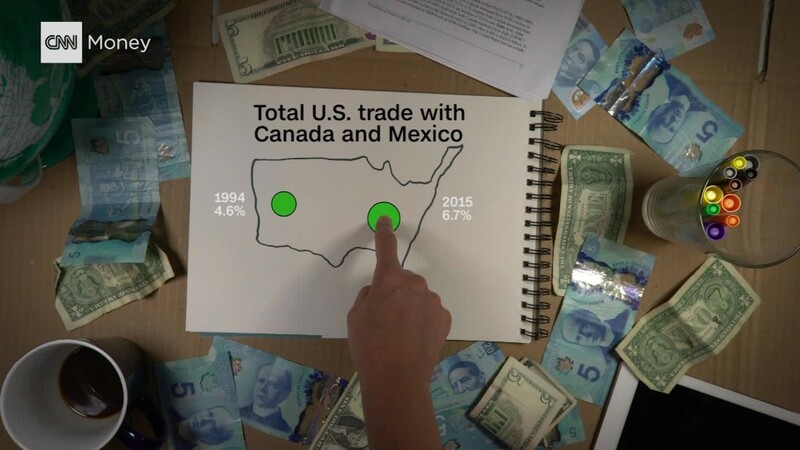 That threat has kept fears elevated about the potential for a trade war with Canada and Mexico, America's second and third top trade partners, respectively. America's lead negotiator for NAFTA will be John Melle, the current U.S. assistant trade representative for the Western Hemisphere. Melle has been at the USTR since 1988. The USTR didn't immediately reply to a question about whether Melle had a role in the original NAFTA negotiations in the early 1990s. The deal went into effect in 1994. Mexico's economic ministry welcomed the announcement of the first round of talks. Canada's trade ministry spokesman also welcomed the USTR's announcement, and added that Canadian officials "look forward to modernizing NAFTA into a progressive trade agreement."